“An extraordinary bell-bottomed flare-fest” – This album cover is an optical illusion – their flares are really only three feet wide. Status Quo were an important band when I was growing up in the eighties. I was quick to realise I stood out – probably only took me a year and a half – and when the ceaseless mockery of my appearance (my wide-toed shoes were called “bible-bashers”– I never knew why – Google is silent on the subject) finally seeped in, I was anxious to fit in a bit more. The uniform I chose was Madness-inspired: a green bomber jacket, drainpipe trousers, white towelling socks, and a more pointy-toe shoe. For those who eschewed the Mod-look, the Ronnie-Corbett-middle-aged-golfer-inspired look was in: known as “Casuals”, these kids wore Farah trousers and Pringle jumpers (possibly with a diamond pattern). Girls wore ra-ra skirts, heavy make-up and disapproving looks. Dressed in my new clothes, when I heard the opening chords of Status Quo’s “Caroline” (live from the N.E.C.) on the radio, I thought they just dripped with electricity and excitement. My ears had been more accustomed to Tommy Steele’s “Flash Bang Wallop” (my parents had the 7” single) and The Wombles’ “It’s Bungo’s Birthday” (yes, that was a tune and Bungo really was a Womble*). Despite “Caroline” being nearly ten years old, it was new and exciting to me. I think I loved “The Quo” – that cockney gateway drug for heavy rock – because I hadn’t really heard much music like that before. Of course, as I bought the Back to Back, Live at the N.E.C. and Twelve Gold Bars albums shortly after, the more cynical might point out I would soon hear exactly that same music on every album. I disagree. But only a bit. This brings us back to the subject of fashion. Dressing as a faux-Mod stemmed slightly the heavy flow of taunting, but when it came to my increasing love of Status Quo, the clothes just didn’t fit. 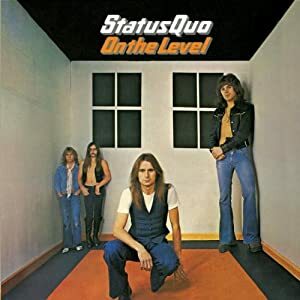 However, having seen the cover of On The Level, (an extraordinary bell-bottomed flare-fest – and just check out the guy in the leather boots and waistcoat at the back) I knew enough to know that dressing like Status Quo, and liking their music must remain two very separate things. If I had grown my hair like Francis Rossi, I might as well have pasted a “Kick Me” sign on my chest to add to the one the other kids had stuck on my back. Record #3 – Status Quo – Caroline – Live at the N.E.C.